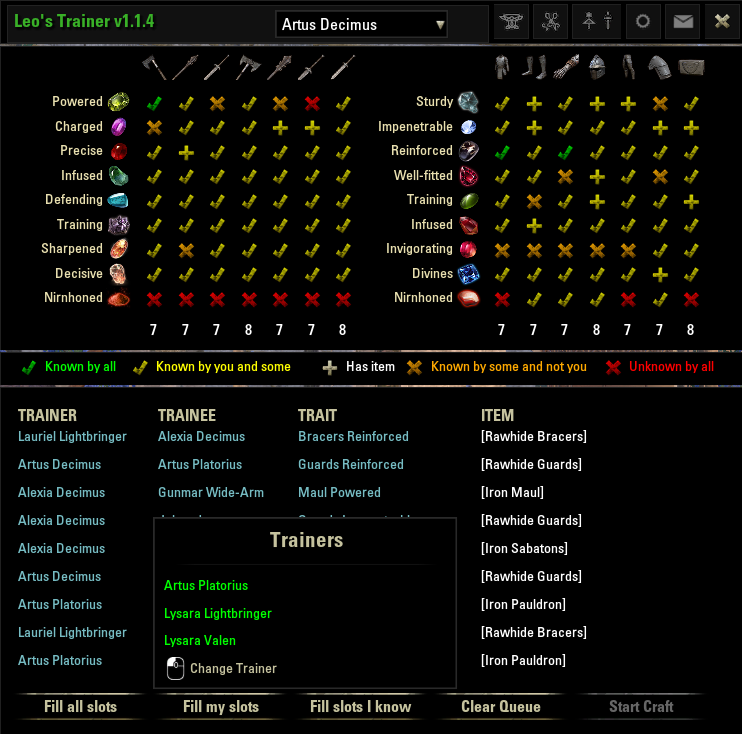 An AddOn that helps training your alt on crafting skills (blacksmithing, woodworking, clothing and jewel crafting). Type "/leotrainer" on your chat to open the main window or use the KeyBinding. The "Fill Slots" button will search for any empty research slots in all your chars and add it to the queue. 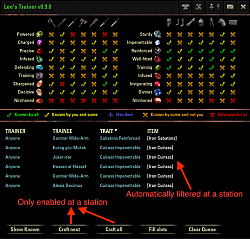 The add-on will add the ones with least traits known, eg fewer research times. On any char, open the main window and click "Fill Slots i know"
You need to login with each character with Leo's Altholic enabled for them. All crafted items will be of white quality and use basic materials (iron ingot, sanded mapple, jute and pewter ounce). 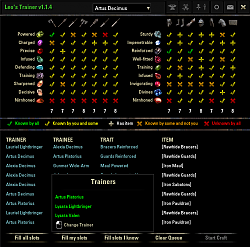 No need to waste valuable resources on training, eg. better deconstruct a purple item than use it for research. Will use only playable race style materials (can be bought from vendor). - Showing quantity of queued items on chat upon "Fill ..."
- Fixed the Fill slots for researches finished on other chars but not yet logged in to marked them as done. - Setting to search inventory for items with searchable traits (integration with FCOItemSaver too) and show in the grid. In the near future, you can ignore such trait for queue purposes. - This one needs LeoAltholic 1.2.2 or above, please update! - Decreasing time between crafts during "Craft All"
I found the problem. Will fix it today. Thanks! Released a new version (0.9.1). Could you try it? Thanks! Actually, there are more. I couldn't craft a maple shield today. I'm investigating. Ok, found a problem with material requirements, fixing it soon. TooltipControl: Attempt to set invalid or malformed link. Does it show if the Research item is in your Bank? That's where mine are kept and none of them show up. +Has Item: Does not show that the char has the item. Last edited by hagermanj : 10/09/18 at 04:43 AM. The "Has Item" is not working right now, will finish the implementation soon, sorry. But the problem is, the almost new chat, only put in 4 items, when i pressed Fill Slots, even that it should be more, or am i missing some thing? I know you have not implemented that it put EVERY thing that is unknown yet, but as i can see or read, is that it should at least put in the ones with shortest research time, but looking at the list it produces, it did not put in all the 5h research items. And how do i set up the Settings. 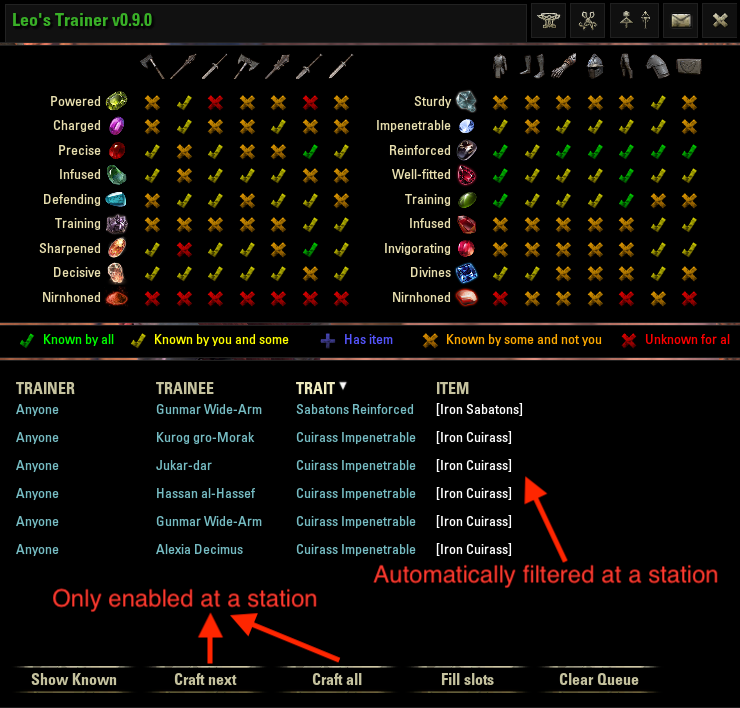 i do not get the "Can be trained" and "Fill Empty Slots"? The Can be trained, is that the "alt" ? and "Fill empty slots" is that not also the alt, since hes the one that got the empty slots? Or should i just enable every thing there ? Hi! Thanks for the feedback. Actually, the "Fill slots" fills em empty research slots for all alt. 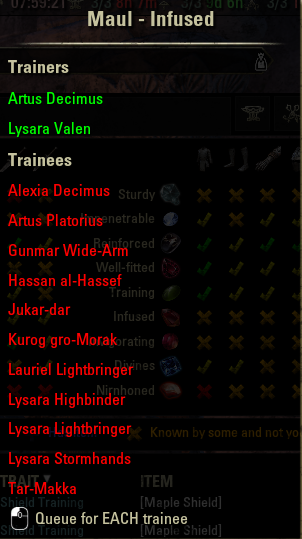 So if you have 2 alts and one has 1 empty slot in blacksmith and 1 research ongoing (1/2), the addon will look for a trait that one other alt can craft to train this one and add to the queue. 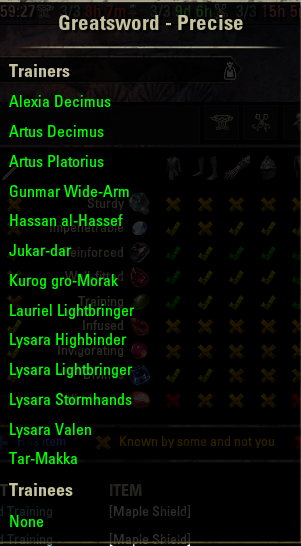 If you want to queue all items from a skill like (like all unknown sword for all chars), click in a a trait for a sword (like powered sword). Last edited by LeandroSilva : 10/13/18 at 08:52 AM.